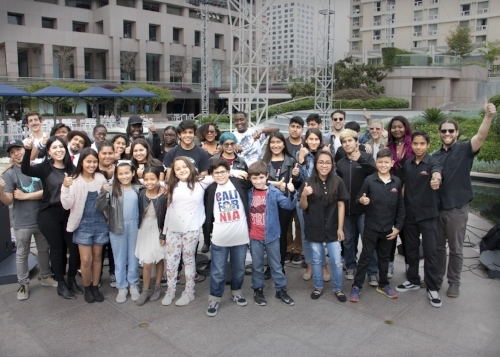 In the Band's View Park High School band "Awoke" performed a set of original and cover songs at the Museum of Contemporary Art's (MOCA) annual Teen Night in downtown Los Angeles. The band was honored to be apart of the event and share the music they have been working on throughout the school year. Inspired by Don’t Look Back: The 1990s at MOCA, Teen Night is created by teens for teens, exploring the vibrant legacy of the 1990s that shapes culture today. MOCA Teen Night 2016 will challenge teens’ perception of the 1990s, a time of both artistic growth and sociopolitical progress. Teen Night is for high school students; it includes free admission to Don’t Look Back: The 1990s at MOCA, art making activities, live performances, refreshments, and a student art exhibition. Thanks to Kala Brand Music Co. for donating 40 ukuleles to Sound Art! Kala is known for quality instruments—the ukulele & Original U-Bass. These instruments will be used in our St. Bernards and Boyle Heights programs to bring the gift of music into many young lives. Thank you so much Kala Brand Music Company! Mahalo! Thank you Fender for all your continued support! The California Arts Council helps maintain California's unique identity by investing in organizations that keep its artistic energy thriving and make its diverse communities healthy and vibrant. The Flourish Foundation Grant Award! Since its inception, The Flourish Foundation has developed various ways to work with and support local youth, classroom teachers and administrators, teaching artists, arts educators, middle and high schools, colleges and universities and community arts organizations. We are fortunate enough to have been awarded a grant through the Flourish Foundation to support our St. Bernard Catholic School Program! The grant will ensure that quality music education is provided to all of our students.